An Oliver Sacks Foundation Best Book of the Year Selection, Finalist for the Books for a Better Life "Best First Book” Award, and a People Magazine Pick in Nonfiction. Andrew Schulman, a fifty-seven-year-old professional guitarist, had a close brush with death on the night of July 16, 2009. Against the odds—and with the help of music—he survived: a medical miracle. Once fully recovered, Andrew resolved to use his musical gifts to help critically ill patients at Mount Sinai Beth Israel’s ICU. In Waking the Spirit, you’ll learn the astonishing stories of the people he’s met along the way—both patients and doctors—and see the incredible role music can play in a modern hospital setting. 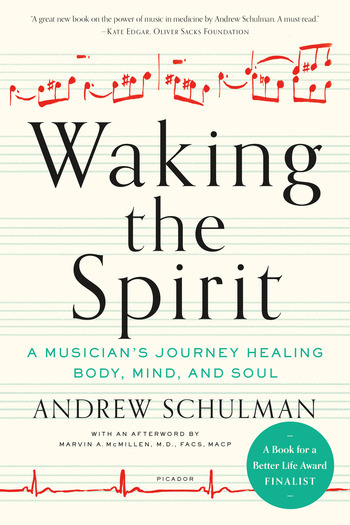 Schulman expertly weaves cutting-edge research on neuroscience and medicine, as well as what he’s learned as a professional musician, to explore the power of music to heal the body and awaken the spirit. ANDREW SCHULMAN is the Medical Musician/Critical Care at Berkshire Medical Center and the first Certified Medical Musician admitted as a member of the Society of Critical Care Medicine. He is the founder and artistic director of the Abaca String Band, which has performed throughout the United States, and also a solo guitarist who has appeared at Carnegie Hall, the Royal Albert Hall in London, the White House, and the Improv Comedy Club, among many others. Schulman lives in New York City with his wife, Wendy, and their dog, Phoebe. He is the author of Waking the Spirit: A Musician's Journey Healing Body, Mind, and Soul.